SSL (Secure Sockets Layer) is a security protocol which is using to secure data between two machines using the encryption. Millions of websites use it every day to secure connections and keep the customer’s data safe. You may know of SSL by some common things that you can see in your internet browser every day. The green padlock icon, the most visible sign of security. The HTTPS protocol in the web address. “SECURE” connection means all transmitted information is private. Display “Company Name” in the browser bar (If installed EV SSL). These indications are helping to identify that the site is using SSL encryption and secure from attackers. Without SSL, attackers and spies can try to steal the personal information from users including credit card details, usernames and the passwords which we use for logging into the website. When the server is communicated with customers’ web browser, then an SSL handshake process is performed. This handshake checks to make sure the certificate is valid. Some SSL Certificate providers have High-Performance SSL Certificate servers which provide fastest SSL Handshake. So, the Owner doesn’t have to worry about losing any customers due to performance issues. Now the customers place an order, your sensitive information is secure with an SSL Certificate and they are assured it’s a safe and legitimate website. The merchant receives the payment, the customer receives the product/service and the attackers cannot get anything. Online business owners want visitors to feel safe when visiting their website so that they need to apply for an SSL Certificate from a trusted SSL certificate provider. Below listed different types of SSL certificates may lead businesses to buy the best SSL certificate for their website. 1DV SSL Certificates – Domain validation certificates are the fast issuance SSL which are used to secure low volume transactions, no paperwork required. It’s less trusted then OV and EV SSL due to only following automated email verification process. 2OV SSL Certificates – Organization validation certificates are ideal for small and medium-size businesses who want to provide robust security as well would like to increase their business credibility. The certificate requester needs to send organizational registration document for validation. 3EV SSL Certificates – Extended validation certificates are highly trusted SSL thanks to its strict verification process, an organization has to prove its legal, operational and physical existence. 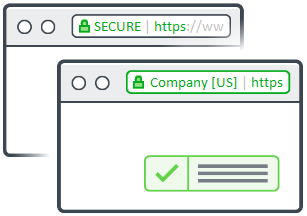 Visitors will notice the company name in the green color text in the “high-security browsers”. You can easily observe that most e-commerce, government, banking and other large volume websites are using EV SSL Certificates. The certificate authority does investigate given information to confirm website and organization trustworthiness. Once the verification process is over, a requester will receive a certificate that includes his business information. Now applicant has to install it on the web server. Below infographic will help you to obtain the right type of SSL certificate that will enable the highest level of protection for your website.